10. Rising Gas Prices - They're never going down again. 9. You lose weight walking to and from the train station. An average city block is equivalent to 200 steps. If you add just 2,000 more steps a day to your regular activities you may never gain another pound. 8. Annual costs of maintaining a car. The yearly cost of operating a car is about $5,174; riding the metro for a year costs $900. 7. Los Angeles Metro riders raise their IQs. Riding the train gives you time to read and study. Textaholics can feed their addiction without breaking the law which prohibits texting while driving. And you can download and watch movies while you ride. 6. 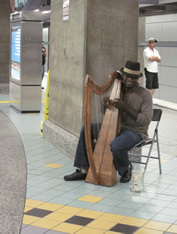 You meet people from all over the city and the occasional harpist. 5. You can go bar hopping without having to drive or spring for an expensive taxi. 4. No speeding tickets, red light tickets or parking tickets - (and you won't be tempted to assault a DOT officer for giving you that last ticket that got your car towed). 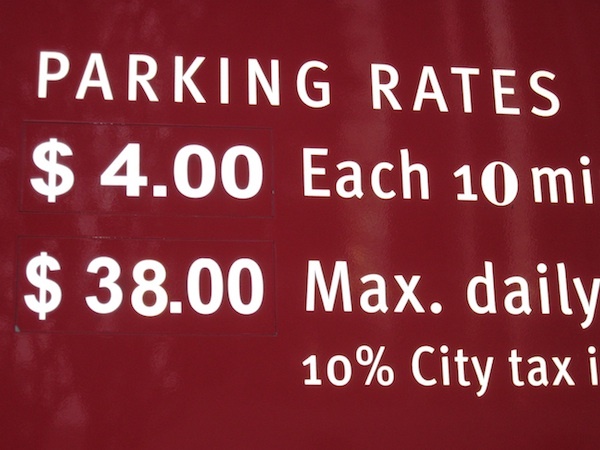 No meters to feed or outrageous parking lot fees. 3. Riding the train reduces your stress level - no aggressive drivers to deal with, no road rage, no bumper to bumper traffic. 2. Taking the Los Angeles Metro during peak rush hour traffic is the quickest and easiest way to get across town. A car driver uses more energy and creates more air pollution in just 4 years than a transit passenger in 40 years. Americans living in areas served by public transportation save 785 million hours in travel time and 640 million gallons of gas a year. One person switching to public transit can reduce daily carbon emissions by 20 lbs, or more than 4,800 lbs in a year. The Los Angeles Metro area has 87 miles of rail lines. The metro rail systems runs through Los Angeles, Hollywood, Pasadena, Culver City and Long Beach. LA Adventures is the first guidebook to explore the city by rail. The travel guidebook contains a wealth of insider information, best kept secrets of LA and loads of practical tips you won't find on our website. To get the paperback edition, click here.